Nedumkotta or Travancore lines was a wall built as a protection against consistent invasion and threats from northern kingdoms mainly Tipu Sultan of Mysore. It was built by the Dharma Raja Karthika Thirunal (d.A D 1764), King of Travancore with the request,support and permission of the Kingdom of Kochi. The Nedumkotta was a defence fortification constructed along the northern borders of the erstwhile Travancore allied Cochin State.of 1757-1762AD.The places north of Nedumkotta was under Zamorin occupied Cochin. (1757-1762)It passed through the territories of the then Cochin State. The Nedumkotta was built primarily to resist the invasion under Hyder Ali Khan against Travancore State and southern parts Cochin state.. It was raised mainly with clay and mud, and reinforced with stones, laterite and granite at strategic places. It started from the KrishanKotta on the west coast, above Kodungallur, and stretched up to the Anamala Hills on the Western Ghats. It was about 48 km long, 20 feet wide and 12 feet high. Its alignment was along the Periyar river on the west coast up to Chalakudy from where it went along the Chalakudy river up to the Annamalai Hills in the east. There were underground cells to store gunpowder and other war materials, special chambers for soldiers to live, and look-outs and mounted field-guns all along the fortification. Besides, on the north side of the fortification, ditches were dug twenty feet wide and sixteen feet deep, and filled with thorny plants, poisonous snakes, and hidden weapons. On the south side as well as on the top of the fortification, wide roads were laid for the convenience of military movements. The fortification was constructed during the regime of Rama Varma Raja, popularly known as Dharma Raja of Travancore, and under the direct guidance and supervision of the then Prime Minister, Ayyappan Marthanda Pillai, and the then Commander of the Travancore Army, the Dutch Captain D'Lenoy. This historic defence line was comparable to the Great Wall of China except that the latter was more ancient and greater in length. It was under the protective cover of this Nedumkotta that a small army of Travancoreans under the command of Raja Keshavadas defeated and frustrated near Alwaye a formidable army led by Tipu Sultan. Today there is no physical evidence of the historic Nedumkotta in the form of even ruins anywhere in the Chalakudy taluk -Konoor (Koratty Kizhakkummuri), Muringoor Thekkummury, Kadukutty,Kuruvilassery,Pallipuram and Poyya- through which it passed. Names of forts remains in Chettuva, Mullurkara,Thrissur and Enamanakhal. However, some place names having a reference to the historic fortification are still popular in the northern borders of the erstwhile Cochin and Travancore States - Krishnan Kotta (meaning Krishnan Fort), Kottamukku (fort corner), Kottamuri (part of a fort), Kottaparampu (fort land), Kotta Vazhi (fort road), Kottalaparampu (magazine ground), Palayam (cantonment), etc. It started from Pallipuram Kotta near the sea, touches kottamukku, krishnankotta and extended till the Foot hills of the Anamalai in the Western Ghats. The Chalakudy river and lagoon which falls on the alignment was left alone as they themselves were a barrier. A trench 20 feet (6.1 m) deep and 16 feet (4.9 m) wide was built along the northern side of the wall for the full length. At some places the wall reached 50 ft (15 m) in height. Hollows were made inside where about 100 soldiers could hide and make an ambush. A company of soldiers was stationed about every kilometer with ammunition store house at strategic points. There were also caves in the nearby wells to hide in the possibility of an unannounced attack. Muringoor Kottamury (3 km south of Chalakudy) is the place where the NH47 crosses the Nedumkotta. The places where fortification once stood is in the present Chalakudy Taluk in Thrissur District, Kerala. 24 years after his father, Hyder Ali had attacked Kochi, Tipu Sultan started on a conquest to conquer Kochi and Travancore. On 31 December 1789 Tipu attacked the lines and gained entry but was ambushed by a small 20-member team led by Vaikom Padmanabha Pillai of Travancore army and had to retreat. Later in April he came back with reinforcements and this time was able to break into the territory after making the way through the Nedumkotta. He destroyed the wall at Konoor kotaa or kottamuri and advanced further. He filled trenches for a few kilometers to enable his army to move forward.He destroyed many temples but he didn’t touch the mosques. He finally reached the Periyar river banks at Aluva and camped there. However, by this time a small group led by Vaikom Padmanabha Pillai and Kunjai Kutty Pillai went upstream and managed to break the walls of a dam at Bhoothathankettu causing heavy flash floods downstream Periyar river. All the ammunition and gunpowder of Tipu's army got wet and became inactive. He was thus forced to return. Information that the British army was planning an attack on Srirangapatnam hastened his retreat. Many portions of the wall were destroyed during war, others later eroded away due to heavy rains, and trenches were filled up. The most of the ruins whatever left have also been lost due ignorance about the historical structure among the locals. 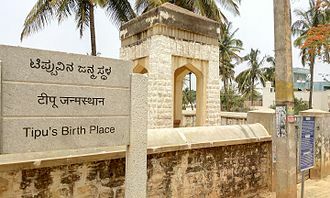 Unfortunately, there are no memorials erected anywhere in Parur, or Angamaly or Alwaye to honour the Dharma Raja, D'Lennoy and Ayyappan Marthanda Pillai who were the architects of the fort; or Raja Keshavadas under whose direct command a comparatively small army humbled and defeated the invading army of Tipu Sultan. 1. Valath, V.,V., K., Keralathile sthalacharithrangal - Thrissur Jilla(in Malayalam), Kerala Sahitya academy 1981. 2. Kerala Charitradharakal (Historical Documents) by Naduvattam Gopalakrishnan, pp. 84–89. 3. Thiruvithamkur Charitram (Travancore History) by P. Sankunni Menon, p. 161. 4. Kerala Charitram (Kerala History) by A. Sreedhara Menon, p. 55. 5. Malabar Manual by William Logan, p. 455. ^ Valath,V.V.K mentions in a local Daily, Mathrubhumi on 1978 July 6 about a cave being found when a village road was being excavated near krishnankotta and subsequently being destroyed. This he mentions was part of the structure. Wikimedia Commons has media related to Nedumkotta. Vismaya is an amusement water theme park situated near Taliparamba in Kannur, Kerala. The park is developed and run by Malabar Tourism Development Co-operative Limited and it is situated near to the famous Muthappan temple in Parassinikadavu. It was officially inaugurated in August 2008 and since it has one of the favorite holiday destination in Malabar. The park is operated by the rain water collected by the reservoir spread over two acres of land with a capacity of 50 million litres of water. Malabar Tourism Development Cooperative Limited was registered on February 15,2000, and one month on March 9,2000 kick-started its operations with E. P. Jayarajan as the Chairman. But all these occupations faced many challenges which gradually lead to an economic decline, in such scenario, to meet the growing market and to create more job opportunities in addition to catering to the growing tourism industry, MTDC came into existence. The main objects of MTDC are to promote, establish and manage the business related to tourism and hospitality industry by setting up establishment such as, Amusement park, tour operations for foreign and domestic tourists. Periyar is the longest river and the river with the largest discharge potential in the Indian state of Kerala. It is one of the few rivers in the region. The Periyar is of utmost significance to the economy of Kerala and it generates a significant proportion of Keralas electrical power via the Idukki Dam and flows along a region of industrial and commercial activity. The river provides water for irrigation and domestic use throughout its course besides supporting a rich fishery, due to these reasons, the river has been named the Lifeline of Kerala. Kochi city, in the vicinity of the river draws its water supply from Aluva. Twenty five percent of Keralas industries are along the banks of river Periyar and these are mostly crowded within a stretch of 5 kilometres in the Eloor-Edayar region, about 10 kilometres north of Kochi harbor. The Periyar has a length of approximately 244 kilometres and a catchment area of 5,398 square kilometres. The source of the Periyar lies high in the Western Ghats and it is variously claimed to be located in Kerala and in the neighbouring state of Tamil Nadu. This has admitted by the state of Tamil Nadu in the court. The source of the lies in the remote forests of the Periyar Tiger Reserve. Various sources indicate the origin of the river to be Chokkampatti Mala, there are alternate claims for a Tamil Nadu origin, indicating that the Periyar originates in the Sivagiri peaks of Sundaramala, Tamil Nadu. However, the Supreme Court of India in its judgement on the Mullaperiyar issue in 2014, after flowing 48 kilometres from its origin and on reaching Mount Plateau at its eastern end, it is joined by the west-flowing Mullayar—an important tributary—at Mullakudy. During this journey the Periyar traverses through the Periyar Tiger Reserve, the Mullaperiyar dam is constructed at the confluence of the Periyar and Mullayar to create the Periyar Thekkady lake and reservoir, as well as the Periyar National Park. The area belonging to Tamil Nadu in the Periyar basin is located far down the river from the Mullaperiyar Dam site and this area is drained by the tributary Nirar, which is diverted to Tamil Nadu as a part of inter-state Parambikulam-Aliyar Project agreement. In India, Chinese fishing nets are fishing nets that are fixed land installations for fishing. While commonly known as Chinese fishing nets in India, the formal name for such nets is shore operated lift nets. Huge mechanical contrivances hold out horizontal nets of 20 m or more across, each structure is at least 10 m high and comprises a cantilever with an outstretched net suspended over the sea and large stones suspended from ropes as counterweights at the other end. Each installation is operated by a team of up to six fishermen, while such nets are used throughout coastal southern China and Indochina, in India they are mostly found in the Indian cities of Kochi and Kollam, where they have become a tourist attraction. The Indian common name arises because they are unusual in India, the system is sufficiently balanced that the weight of a man walking along the main beam is sufficient to cause the net to descend into the sea. The net is left for a time, possibly just a few minutes. The catch is usually modest, a few fish and crustaceans, each 30 cm or so in diameter, are suspended from ropes of different lengths. The Mysorean invasion of Kerala was the military invasion of Malabar, including the territories of the Zamorin of Calicut, by the Muslim de facto ruler of the Kingdom of Mysore Hyder Ali. After completing the occupation, Kingdom of Cochin, situated south of Malabar, was made a state of Mysore. The major reason for the occupation of Malabar was the desire to have access to the Indian ocean ports, Kingdom of Mysore, nominally ruled by the Wodeyar family, rose to prominence in India after the decline of the Mughal empire. In 1761, Hyder Ali seized control of all of the reins of power in Mysore by overthrowing a powerful minister and he turned his attention towards expansion which included the capture of the Kingdoms of Bednur, Sunda and Canara. Faruqabad, near Calicut, was the capital of the Mysore-ruled Kerala. 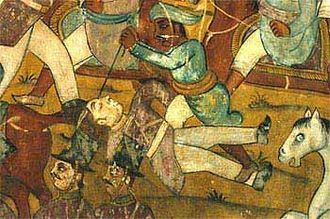 Hyder Alis attempt to defeat Travancore, a British ally state south of Cochin, failed in 1767, Tipu Sultan provoked British invasion in the form of Third Anglo-Mysore War by attacking the Kingdom of Travancore. Thus Travancore was only part of present-day Kerala state that stood outside Mysore authority, by the treaty of Seringapatam, Tipu ceded half of his territories including Malabar to the English East India Company and their allies and paid 33 million of rupees as indemnity. By 1801, the Madras Presidency was created by Lord Wellesley, Travancore was asked by the Company to meet the entire expenditure of the Third Anglo-Mysore war on the plea that the war was undertaken in defence of Travancore. The new treaty of 1795 reduced Travancore from a friend and ally of the English East India Company to that of a protected ally, the King was forced to entertain a subsidiary force far beyond his capacity to subsidise. The Company claimed a monopoly in the pepper trade of the country. Canara forces invaded northern Malabar in 1732 at the invitation of the Arakkal, under the command of Gopalaji,30000 strong Canara soldiers, easily overran prince Kunhi Ambus forts in northern Kolathunad. By early 1734 the Canara soldiers captured Kudali and Dharmapatnam, by 1736, the Canara army was driven out of the whole of northern Malabar with assistance from the English East India Company. Kingdom of Cochin was a late medieval Hindu kingdom and princely state on the Malabar Coast, South India. Once controlling much of the territory between Ponnani and Thottappally, the Cochin kingdom shrank to its minimal extent as a result of invasions by the Zamorin of Calicut. When Portuguese armadas arrived in India, Cochin was in vassalage to Zamorin and was looking for an opportunity to break away, Cochin became a long-time Portuguese protectorate providing assistance against native overlords. After the Portuguese, the Dutch East India Company followed by the English East India Company, even today, the full official designation of the Raja of Cochin is “Perumpadappu Gangadhara Veera Kerala Thrikkovil Adhikarikal”. The Kingdom of Cochin, originally known as Perumpadappu Swarupam, was under the rule of the Later Cheras in the Middle Ages, after the fall of the Mahodayapuram Cheras in the 12th century, along with numerous other provinces Perumpadappu Swarupam became a free political entity. However, it was only after the arrival of Portuguese colonizers on the Malabar Coast did the Perumpadappu Swarupam acquire any political importance, Perumpadappu rulers had family relationships with the Nambudiri rulers of Edappally. After the transfer of Kochi and Vypin from Edappally rulers to the Perumpadappu rulers, ma Huan, the Muslim voyager and translator who accompanied Admiral Zheng He on three of his seven expeditions to the Western Oceans, describes the king of Cochin as being a Buddhist. There is no extant written evidence about the emergence of the Kingdom of Cochin or of the Cochin Royal Family, all that is recorded are folk tales and stories, and a somewhat blurred historical picture about the origins of the ruling dynasty. The surviving manuscripts, such as Keralolpathi and Perumpadapu Grandavari, are collections of myths and legends that are less than reliable as conventional historical sources. There is a legend that the last Perumal who ruled the Chera dynasty divided his kingdom between his nephews and his sons, converted to Islam and traveled to Mecca on a hajj. The Keralolpathi recounts the narrative in the following fashion, The last. He left for Mecca by ship with some Muslims who arrived at Kodungallur port, before leaving for Mecca, he divided his kingdom between his nephews and sons. The Perumpadapu Grandavari contains an account of the dynastic origins. Cheraman Perumal divided the land in half,17 amsa north of Neelaeswaram and 17 amsa south, totaling 34 amsa, thirty-four kingdoms between Kanyakumari and Gokarna were given to the thampuran who was the daughter of the last niece of Cheraman Perumal. Keralolpathi recorded the division of his kingdom in 345 AD, Perumpadapu Grandavari in 385 AD, including Robin Jeffry and Samuel Mateer, are of the opinion that as with all other Kings of Malabar, the Cochin Raja was of Nair origin. Cochin kingdom ruled over a vast area in central Kerala before the Portuguese arrival and their state stretched up to Ponnani and Pukkaitha in the north, Anamalais in the east, and Cochin and Porakkad in the south, with capital at Perumpadappu on the northern border. Harimattom pooram is the one of the famous pooram in Ernakulam. The most famous pooram in whole world is Thirumandhamkunnu Pooram which has a participation of 11 Lack people across the country. Most pooram festivals have at least one ornately decorated elephant being paraded in the procession out of the temple precincts. Vela is a festival like pooram, thrissur Pooram is the most famous of all poorams. The second best known Pooram in Kerala is Uthralikavu Pooram. A melam is a performance of different kind of musical instruments that are unique to Kerala and is something akin to the jazz. The most traditional of all melams is called Pandi Melam which is performed outside the temple. Another kind of melam is called Panchari Melam, which is similar to Pandi Melam going by the kind of instruments, panchavadyam is another classical musical ensemble performed in Kerala. Here, five different kinds of instruments create a breathtaking and fastmoving percussion performance, the five instruments are Madhalam, Edakka and Timila. The Kingdom of Travancore (/ˈtrævəŋkɔər/, Malayalam, തിരുവിതാംകൂർ Thiruvithamkoor, was an Indian kingdom from 1729 until 1949. It was ruled by the Travancore Royal Family from Padmanabhapuram, the official flag of the state was red with a dextrally-coiled silver conch shell at its center. In the early 19th century, the became a princely state of the British Empire. When the region was part of the Chera empire, it was known as Thiruvazhumkode. It was contracted to Thiruvankode, and anglicised by the English to Travancore. In course of time, the Ay kingdom, part of the Chera empire, which ruled the Thiruvazhumkode area, became independent, the Aayis controlled the land from present day Kollam district in the north, through Thiruvananthapuram district, all in Kerala, to the Kanyakumari district. There were two capitals, the one at Kollam and a subsidiary one at Thrippapur. The kingdom was called Venad. Kings of Venad had, at times, travelled from Kollam and built residential palaces in Thiruvithamcode. By the time of King Marthanda Varma, the half of the kingdom had become dominant. During his reign, it absorbed the north and Thiruvithamcode or Travancore became the official name, Travancore was located at the extreme southern tip of the Indian subcontinent. Geographically, Travancore was divided into three distinct regions, the eastern highlands, the central midlands, and the western lowlands. Venad was a state at the tip of the Indian Subcontinent. Till the end of the 11th century AD, it was a principality in the Ay Kingdom. The Ays were the earliest ruling dynasty in southern Kerala, who, at their zenith and their capital during the first Sangam age was in Aykudi and later, towards the end of the 8th century AD, was at Quilon. Though a series of attacks by the resurgent Pandyas between the 7th and 8th centuries caused the decline of the Ays, the dynasty was powerful till the beginning of the 10th century, when the Ay power diminished, Venad became the southernmost principality of the Second Chera Kingdom. Dharma Raja Karthika Thirunal Rama Varma was the Maharajah of Travancore from 1758 until his death in 1798. He succeeded his uncle Marthanda Varma, who is credited with the title of maker of modern Travancore, during his reign Dharma Raja not only retained all the territories his predecessor had gained but administered the kingdom with success. Rama Varma was born in 1724 AD as the son of the Senior Rani of Attingal with her husband Prince Kerala Varma Koil Thampuran of the Kilimanoor palace and he had a brother Prince Makayiram Thirunal, grandfather of Irayimman Thampi, who pre-deceased him. His mother was adopted from the house of Kolathunad in 1718 by the King of Venad into the Travancore Royal Family. He was born into a time of turmoil caused by the refractory Lords. With the death of his uncle Marthanda Varma in 1758, Karthika Thirunal Rama Varma succeeded to the Travancore musnud, with the able services of the Dalawa Ayyapan Marthanda Pillai, Karthika Thirunal began his reign. The fortunes of the Cochin royal family were at the lowest ebb, a very small portion of their original territory alone remained in the Cochin Rajas possession. From 1755 AD, the Zamorin of Calicut Kingdom, was in possession of the portions of Cochin. Although Marthanda Varma had promised help against the Zamorin by signing a treaty of alliance in 1756 with Cochin, most of the barons of Kochi had sided with the enemy. The Raja of Cochin deputed his nephew to ask for assistance from Rama Varma. The same feeling might have prevented Marthanda Varma, his uncle, at last the Raja of Cochin met with Rama Varma to press his request. He strengthened his promises with the sanction of religion, the account of this campaign is best given in the words of late Mr. C. Achyutha Menon, a native of Cochin, whose acquaintance with the records of the Cochin government, to which he was secretary for a long time, the Zamorin sent an express messenger to Trivandrum to beg the Maharaja to stay the hands of his General. In 1759 AD, the Rajah of Cochin sent his nephew to sign a treaty with Travancore, the little kingdoms of Parur and Alangad were annexed to Travancore after pensioning off the ruling families. Pulikkali is a recreational folk art from the state of Kerala. It is performed by trained artists to people on the occasion of Onam. On the fourth day of Onam celebrations, performers painted like tigers and hunters in bright yellow, literal meaning of Pulikkali is the play of the tigers hence the performance revolve around the theme of tiger hunting. The folk art is mainly practiced in Thrissur district of Kerala, best place to watch the show is at Thrissur on the fourth day of Onam, where Pulikkali troupes from all over the district assemble to display their skills. The festival attracts thousands of people to the Thrissur city, Pulikkali is performed during various other festive seasons. Later, Konar of used to celebrate with great fervor and they popularised the folk genre with steps and body language peculiar to a tiger being stalked by a hunter, enacting a play of the hunter and the beast. Along with the celebrations, they used to perform the art form decked as tigers with peculiar steps resembling the tiger, Pulikkali in Thrissur is held in memory of this event. Over the years, there has been changes in the adornment of Pulikkali dancers, in the early days, masks were not used and participants would have themselves painted all over, on their faces as well. But now, ready made masks, cosmetic teeth, beards, the tigers wear a broad belt with jingles around their waist. The festival in Thrissur has now become an all peoples event with huge response from people, especially youths who come forward to participate in the festival, and from sponsors. The event is organized by the Pulikkali Co-ordination Committee, a council of Pulikkali groups formed in 2004 in Thrissur to preserve. The Thrissur Municipal Corporation give a grant of Rs 30,000 for each Pulikkali troupe, a striking feature of this folk art is the colorful appearance of the performers. A particular combination of powder and varnish or enamel is used to make the paint. First of all, the remove the hair from the body, and then. It takes two to three hours for the coating to dry, after that, the second coat of paint is applied with enhanced design. Clockwise from top: Mysore Palace, Shivanasamudra Falls at Mandya, Infosys Building, Brindavan Gardens, Somanathapura, Lalitha Mahal, St. Philomena's Church, Mysore and Chamundeshwari Temple. Cape of Kodungallur, where Periyar empties into Arabian Sea. Chinese fishing nets in the beach, believed to be installed by 14th century Chinese explorer, Zheng He, have also become a popular tourist attraction. Caparisoned elephants during Sree Poornathrayesa temple festival, Thrippunithura. Caparisoned elephants and Panchavadyam performance during Sree Poornathrayesa temple festival, Thrippunithura. Kottakkunnu is a very beautiful tourist location in Malappuram, Kerala.